Like so many of my fellow readers, I love it when an author has their characters talk about their love of reading or libraries, or specific books from the past! I am guaranteed to stop reading and go back and reread a passage again if they do so that I too can savour the words and emotions expressed. I therefore thought that I might start to share some of these bookish quotes on an irregular basis. It won't be with every book, but just when I remember or, you know, have nothing else ready to post or whatever! Sometimes the quotes will only be short and other times long but hopefully they will capture the imagination of my fellow readers. And if they happen to entice other readers to pick up the book in question then that is an added bonus! 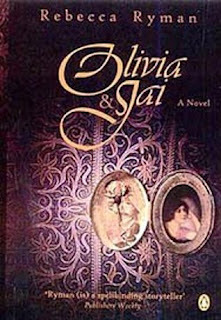 The first of these quotes comes from pages 106-108 of Olivia and Jai by Rebecca Ryman and has the title character, Olivia, being invited into the library of the Maharaja. The book is set in colonial India, and if you like a good old fashioned saga then this could be a book for you! An early night was called for, but, still charged with excitement from everything she had seen, experienced and heard, Olivia felt not the least sleepy. "I am in the habit of reading awhile before I got to bed. My uncle tells me you have an extensive library here with a fine collection of rare books. May I be permitted to browse there for a half hour?" Olivia's request pleased the Maharaja, and an aide was immediately dispatched to unlock the library, housed in a separate building, and prepare it for her perusal. She bid Kinjal good night, for they would not now meet before the morning, and followed the Maharaja across the compound. During the slow, leisured walk they discussed books. "Bernier's travel diaries about India might interest you, Miss O'Rourke, and perhaps Kalidasa's epic poem, Shakuntala. I have translations of both in English." They chatted for a few more minutes on the steps of the library, a handsome white single-storied building with scarlet bougainvillea spilling over the portico, and then the Maharaja excused himself, pleading matters still to be attended to for the shoot. "We are truly delighted that you are with us, Miss O'Rourke," he said; then, with visible hesitation he added in a murmur something that was extraordinary, "but I sincerely hope you never have occasion to regret your visit." For a moment Olivia stood rock still. There was a gusty breeze blowing and the Maharaja's voice had been low; after brief introspection Olivia decided that the two had combined to deceive her ears, for there could be no logical explanation for what she thought he had said. With a shrug, she abandoned her bafflement and went inside. Like the evocative aroma of damp earth, there is also something universal in a room filled with old books. Glass-fronted cupboards lined with velvet stood open for her benefit; calf-bound volumes, neatly labelled and stamped in gold with the crest of Kritinagar, were arranged in order of language and subject. Ledgers, also bound and crested, gave cross references and relevant information in that immaculate, decorative calligraphy that was a natural product of Indian aesthetics. On the reading desk a paraffin lamp threw a bright pool of light in which were placed three or four books meant for her attention. With a discreet cough the aide walked into an adjoining chamber and left Olivia to her own devices. As she slipped into the seat and cautiously fingered the bound volumes, Olivia washed over with nostalgia for her father's precious collection of books, which had been her responsibility to look after, and for Sally MacKendrick's one-room lending service, which went by the rather grand name of the "library". Sally too loved books and they had together spent many hours of contentment labelling, cataloguing and arranging the collection her father had helped Sally acquire as a small business after Scot MacKendrick had fallen prey to a band of claim jumpers at the mines where he worked. The lingering mustiness in the air of the Maharaja's library was like a whiff of home, but the rest of the environment she was in now contained an element of unreality, a dreamlike ethereality that seemed to remove her into quite another dimension, one she could not quite assimilate. Oh, that was a beautiful passage, and I can imagine how excited I would have been to be the Olivia in that library! This might indeed be a book for me! Thanks for sharing this with all of us! Zibilee, if you are interested in big sagas and/or books set in India you might like this one! It certainly has that feel about it!